Flora tattoos have become so common today. Traditionally especially in the Western countries, these tattoos were mainly common among women. However, men have continued to embrace these tattoos day by day. The origin of this type of tattoo can be traced among the Japanese who have high regard for the flower. Japanese culture has high regard to floral tattoos and thus it is said Japanese might have been the first to embrace this tattoo. However, other cultures have loved this type of tattoo because flowers have a lot of symbolic meaning to many people. Floral tattoos consist of decorations of flower patterns. Floral tattoos can be used to symbolize success. Many people use the symbol of a flower to symbolize success in something. In fact, when someone succeeds in something, friends go with flowers to congratulate the individual. The same case, people wear these types of tattoos to show they have succeeded in something that they value in their life. One of the most well-known symbolism’s of a flower is love. No wonder, during valentines, people give their loved ones bunch of flowers to symbolize love. Floral tattoo use flower patterns to represent love. A person may wear a floral tattoo to represent the love he has or she has to the pattern. Love is the major symbolism for floral tattoo. A flower like Camellia has been used to represent passion. When used in a floral tattoo, the same meaning is symbolized. It’s soft and round petals couple with gentle curves shows passion or desire. People who have passion to do something special may wear this tattoo to bring out the passion in their hearts. Growth is another special attribute that is represented by floral tattoos. For any flowering plant, the presence of a flower indicates growth. Therefore, people also use a flower to symbolize growth. People who believe they have grown in different aspects of life use this type of tattoo to symbolize growth. Women may wear floral tattoo to symbolize fertility. For a flowering plant to produce fruits, it must first produce flowers. Therefore, people use this to symbolize fertility since the flower in the flora tattoo can represent fertility. White flowers can be used to symbolize peace. Therefore, for people advocating for peace or just want to bring out the message of peace, they can wear floral tattoos to represent peace. A floral tattoo comprising of a blossoming flower can be used to represent happiness. Blossoming flowers looks great and they show a new dawn and thus can be used to symbolize happiness. However, the above discussed symbolism’s of floral tattoos are just the main meanings. This type of tattoo can have a lot of meaning depending with type of flower used in the tattoo. Rose flower is one of the common elements in tattoos. 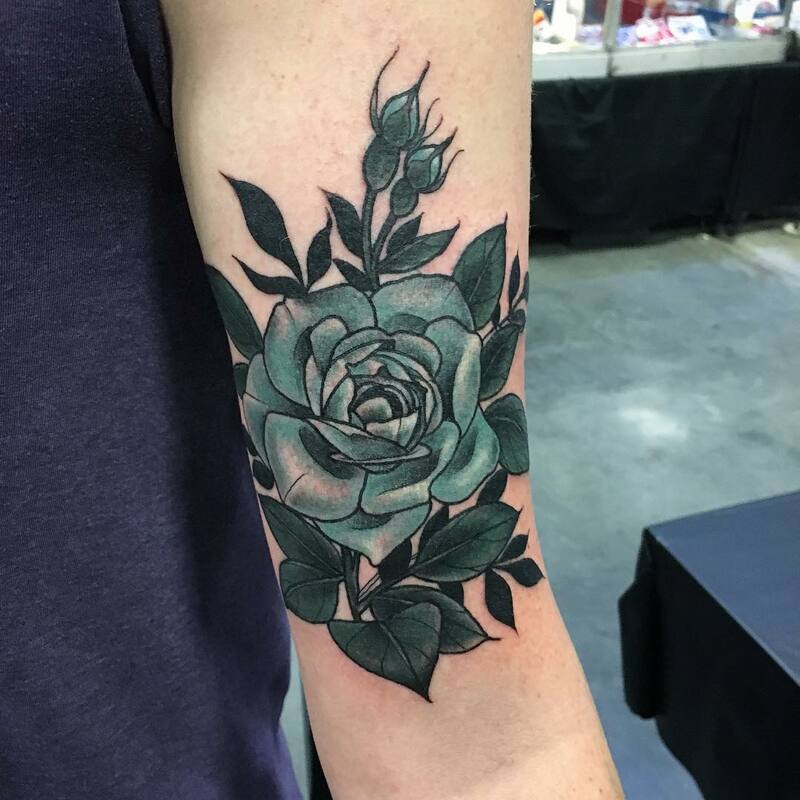 In a floral tattoo, a rose can have different designs. There are designs that only consist of just the rose flower and what differs is the color of the rose flower. Other designs of rose floral tattoos may add other elements like a compass. The good thing with this type of tattoo is that it is simple and attractive. It is fit for both men and women. This is another type of floral tattoo that is known for its beauty. It comprises of a lily flower that is painted in different shapes. For instance, a design can have the top of a lily flower while another may include the whole part of a lily flower. This type may bring some addition meaning to floral tattoos like purity and chastity. It is one of the beautiful tattoos designs we have. This tattoo comprises of peony flower. Again there are different designs associated with peony flower. Creativity is what matters. Mainly, includes the flowers, the leaves and the stem of a peony. It may have just only one flower or multiple numbers of flowers. This has become popular since people use to mean wealth or fortune. It is cool tattoo though. 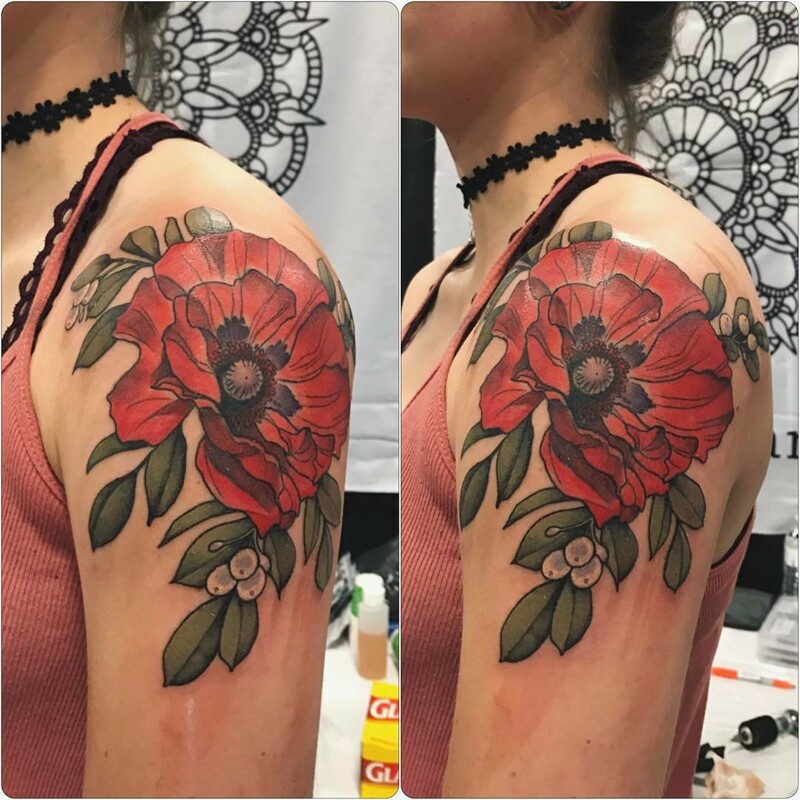 This type of floral tattoos consists of poppy flowers. The poppy flowers are decorated with nice colors to make them attractive. The flowers may be many or just one. Some other designs consist of the whole plant. Hibiscus flower is a popular flower among the Japanese. In their floral tattoos, they use it to symbolize gentle. However, they use this type of floral tattoo to symbolize other meanings like power and respect. What brings out the difference is the context in which the tattoo is used and the placement in the body. This consists of a dog wood flower that is common among many cultures. 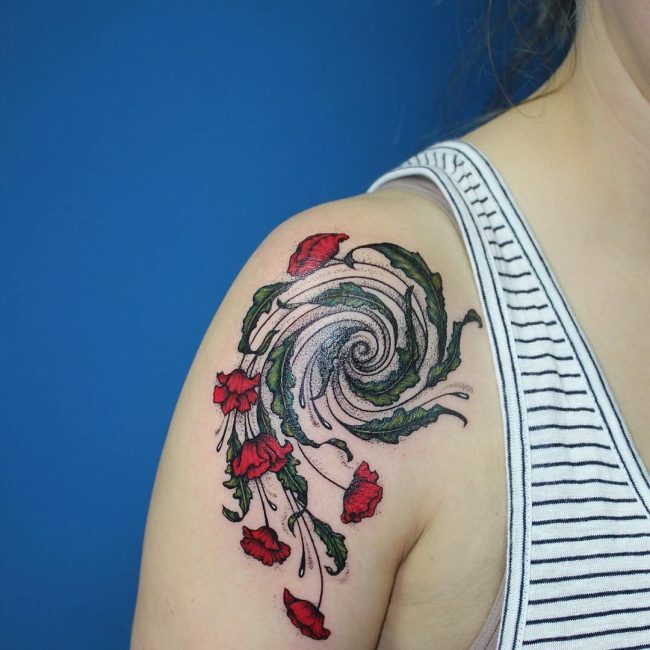 The dogwood has good looking petals that make this tattoo beautiful. It is used by many people to show their enduring love. It appears much better when the tattoo consists of a series of dog wood flowers unlike just having one. This design consists of an aster flower. Aster flower can be decorated with both pink and purple. There are various designs that can be made from an aster flower. For instance, one may have a tattoo with an aster flower and some other flowers like roses. Another idea would be have the whole plant of an aster flower. Whichever, the design, this type is beautiful and worth having. This tattoo consists of cherry blossom which have petals being blown away by wind. It can be placed of the sleeve of the hand. This tattoo is used to represent the changing nature of life. This type of tattoo brings the element of a butterfly in a floral tattoo. Butterflies and flowers are used together due to their beauty. Such a tattoo with both elements looks more beautiful and attractive. From the discussion above, floral tattoos can have so many types because it all depends with type of flower used. 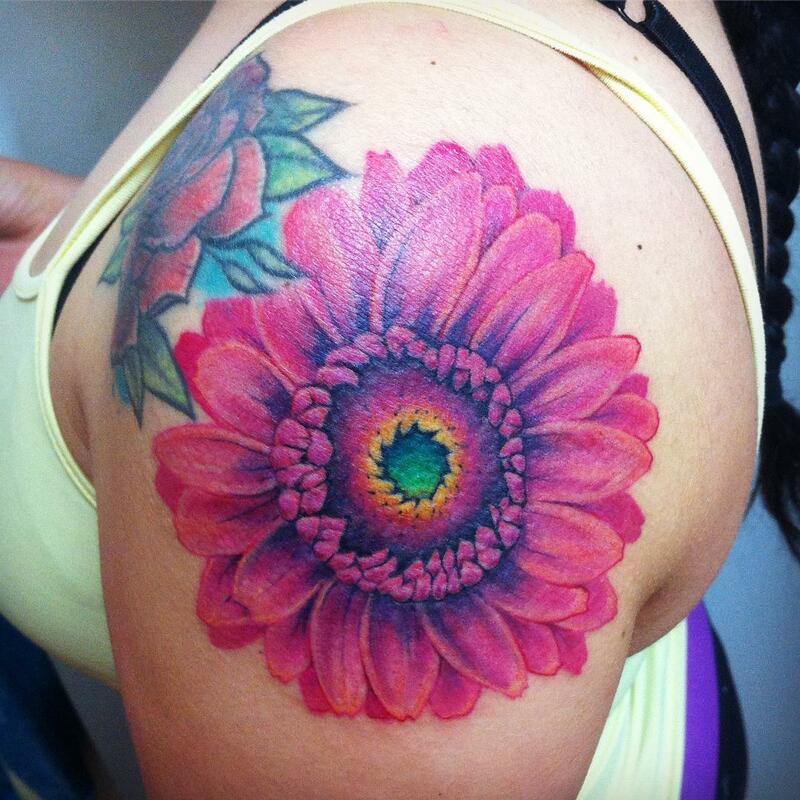 There are so many types of flower that can be used in tattoos. What matters is the symbolism you would like your tattoo to symbolize. All in all, they are very beautiful tattoos and very attractive.